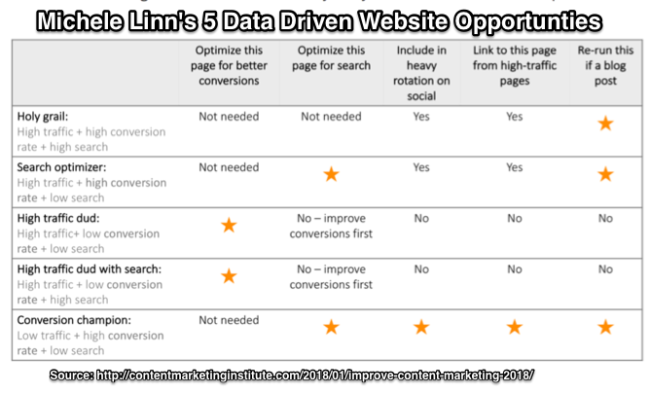 To show measurable content ROI, focus on enhanced existing content marketing. With relatively low marketing investment, enhanced existing content marketing up-cycles published content to keep it up-to-date and visible. Backlinko’s Brian Dean is one of the most successful proponents of enhanced existing content marketing – also known as reused content, repurposed content and/or recycled content. Before creating new content, Dean ensures that every published piece is the best it can be. 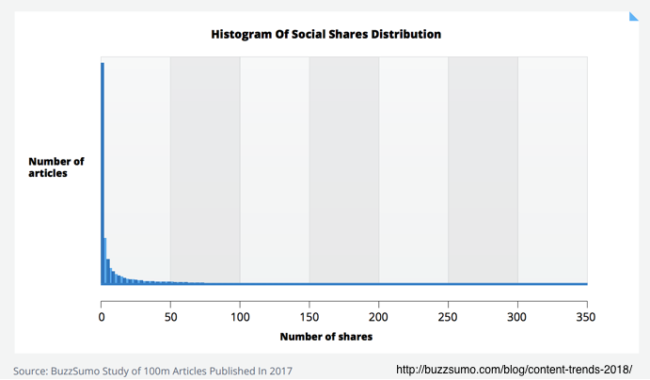 To create and keep a piece of quality content visible in a Post-Content Shock landscape where the average article attracts 4 social shares requires continued improvement and repromotion to maintain its content health. Dean proved this with his 2018 SEO Tools update. Dean examined 188 free and paid tools and added different data sorting options. As a result, that article has over 18,000 social shares and 950 comments. 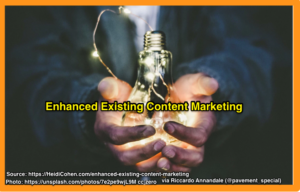 This article provides a primer on enhanced existing content marketing; it defines it and offers a 5 step process to enhance your published content performance. Enhanced existing content marketing improves and repromotes content within your organization to make it contextually relevant. As a result, it stays visible building your brand, attracting readers, and generating sales. Enhanced existing content also adds to your organization’s information including text, photographs, visual, video, audio and presentations making new connections to maximize content consumption. While eliminating once and done content, enhanced existing content marketing laser-focuses on the most effective content that can be easily be improved, updated and/or repromoted. It values mobile-first, cross device, and cross platform approaches. Occurs post-initial publication. To maximize its initial creative investment, all related content is developed at the same time. So enhanced existing content marketing invests in additional creation and promotion. Is based on performance to-date. Use a content audit to determine which content will benefit from improved presentation or promotion. Maintains content distribution. It continues promotion and expands distribution channels. Uses content curation to keep content visible and relevant. Requires additional budget for incremental creative and promotion. But these costs are less than new content creation costs. Enhanced existing content marketing extends the content’s vitality. As a result, it creates a second lifetime value (LTV). Follow this 5 step process to maximize existing content results. Evaluate your content marketing results against internal standards including past performance. Use a content audit to determine: the content that continues to yield good results, the content that needs to be improved, and content that is no longer useful or relevant. Have you positioned your content to reach right audience at the right time? Is it contextually relevant? Do you provide content topics your readers want? 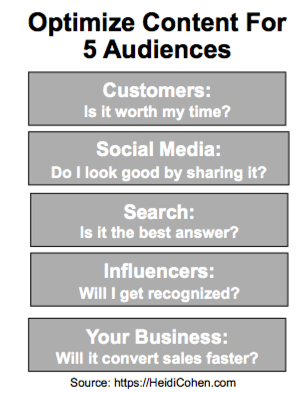 How does your audience including influencers consume content? Which keywords perform best? Do you use your audience’s language? Where does your audience spend its time with content? What creative and content formats resonate best with your audience (text, visuals, video, audio or presentations)? Is your content optimized for the devices your audience uses? Think mobile-first. Are your headlines optimized for results? Is your existing content part of your on-going repromotion and distribution strategy? Do you need additional paid promotional support? Boost existing content performance by giving it a fresh look and filling it with up-to-date information. Vox showed that even minor improvements yielded measurable results: 88 improved stories yielded an incremental 500,000 pageviews. Add or change photos, visuals, video, audio and/or presentation format. Update old data. Get the latest facts. Improve search findability. Use redirects and smart 404 (not found) pages for old, deleted and duplicate content. Include desktop, mobile and voice search. Reword your headline and lede to attract more readers. Connect related content using content silos. Transform content into different formats. Extend content reach with different consumption formats and platforms. Example of how Content Marketing Institute curates internal links to related content. BTW: Don’t just take my advice, here’s how 23 experts recommend improving your content. Don’t let the date fool you. The content is still relevant. 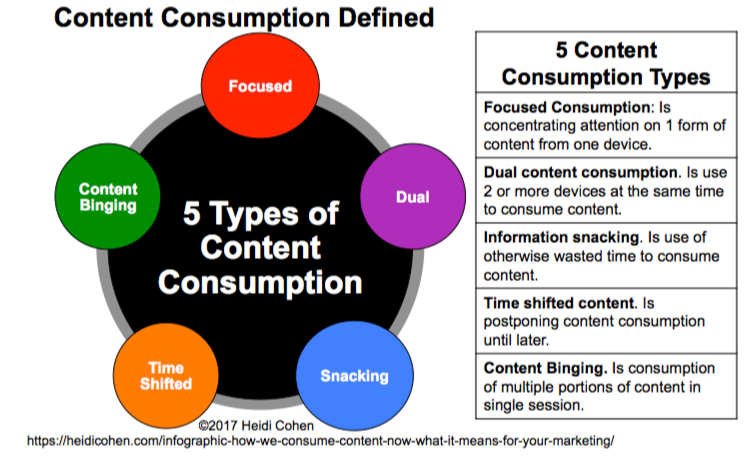 Content optimization consists of 3 key elements. Content optimizations make your content more accessible and findable by your audience, social media, search, influencer and business. As a result, it’s easier to find, share and consume. Here are 50 ways to improve content optimization. Has at least one call-to-action. Remember that you must define next steps for your reader or he’s on to the next piece of content! Includes one or more contextually relevant, content off-ramps to collect reader information. I call this interconnected content. It’s key to capturing email addresses and leads. 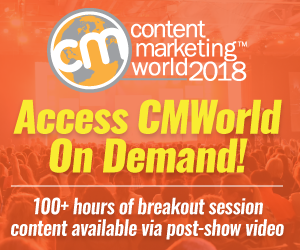 To avoid “Out of sight, out of mind” syndrome include existing content as part of your regular content distribution and promotion across owned, social and third party media channels. Changing content formats to be contextually relevant on new platforms. Using internal content curation to highlight old content in new articles. Continuing to promote older content. Tap into the power of amplification channels. 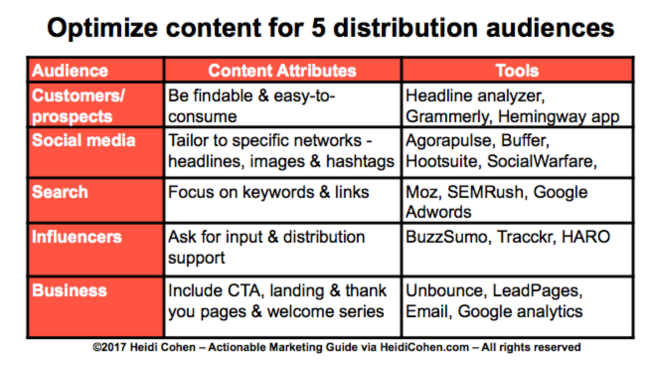 Content amplification focuses on the 3-day post-publication environment, use these channels to keep content visible. Maximize owned media distribution over time. Think beyond blogs and emails. Keep content visible on social media. Optimize it to attract social shares. Include enhanced existing content in your third party media distribution. Tap into the power of influencers. 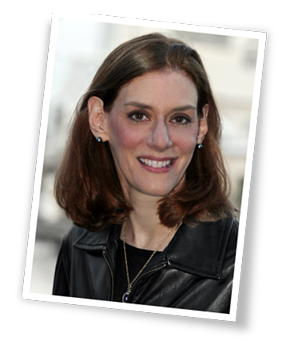 Keep your influencer content visible to attract their attention! Also share their older content. Add paid advertising support where needed. You may need additional budget. Create uberized content. Don’t create duplicate content! Publish what Orbit Media’s Andy Crestodina calls “evil twin” content by posting the opposite point-of-view on LinkedIn Publishing, Medium and guest posts. BTW, here are 50 (almost) free ways to repromote your content. Content marketing budgets require proof that they yield ROI. 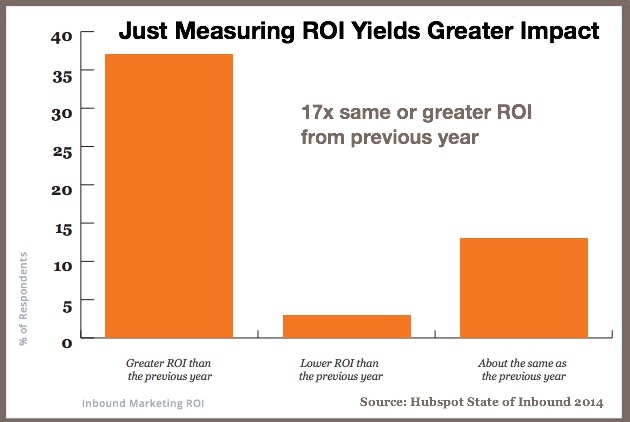 The act of tracking content marketing results improves marketing ROI according to 2014 Hubspot research. Like dieting, you pay attention to the things that matter to yielding results. When you enhance your existing content marketing, your content marketing ROI improves. It costs less to improve and repromote your content than to create new content. Further, it creates a second lifetime value. Measure key contributions towards purchase and other business goals. Don’t just track the last piece of content touched. Track email registrations, leads generated and sales. Associate these metrics with measurable business goals. Assess email, lead and sales quality against your existing customer base. Track expenses to improve and repromote content. Keep a record of tests and events that effect your results. To keep your content marketing visible and relevant, enhance it regularly. Face it: content marketing has grown up and needs to start paying its own way. As a result, your target audience must be able to find it regardless of where, when, why, and what they’re doing. Further, it must be device agnostic and findable on desktop, mobile and voice search. By updating, optimizing and repromoting your existing content, you maintain a constant flow of quality visitors that translate to leads and sales. This type of content marketing costs less than fresh new content. In the process, you learn more about your audience and what works for them and you. Integrate your enhanced existing content resources into your overall content marketing strategy and plans to achieve your business goals and improve ROI. What has your experience with enhanced existing content marketing been? Tags Andy Crestodina, Brian Dean, Content curation, Michele LInn, Rebecca Lieb. Bookmark the permalink.